This is the last instalment of my interviews with designers that have been taking part in the 2016 Ami-Along! If you missed the previous interviews, learn more about: Melissa of Melissa’s Crochet Designs, Mevlinn of MevvSan, Justyna of Cute and Kaboodle, Alyssa of Monster’s Toy Box, and Chloe of Amination. Today, I am happy to introduce to you Keke of Yarn Society! You can find her designs on Ravelry, Craftsy and Etsy. Hope you enjoy learning all about her and her design process. Me: Tell us a little bit about yourself. Keke: My name is Katie, but everyone calls me Keke. I live in Chicago, recently married the love of my life, and am currently expecting my first child. I was a Neonatal Intensive Care Nurse for over 10 years, and absolutely loved it, but was in desperate need of a creative outlet. After attending Pastry School and teaching myself how to crochet, I finally found my happy place. I now run a dessert website and am a crochet designer full-time. Me: When did you start designing amigurumi and why? Keke: I started to teach myself crochet, with the help of YouTube and Craftsy, during the long, cold, and snowy Chicago winter of 2013. After a friend showed me her amigurumi creations and I started learning it for myself, I was hooked. By spring of 2013 I tried my hand at creating my first amigurumi design – Chick-A-Dee. I loved the idea that I could create something that was unique and completely my own, and found enjoyment in the process of writing patterns. I love a good challenge, and can sometimes be a perfectionist, so let’s just say Chick-A-Dee was a true labor of love. I’ll never forget how nervous and excited I was when customers began to buy my first pattern – it was and still is one of the most rewarding feelings. Me: How do you decide what to design next? What inspires you? Keke: More often than not, I decide what to design on a whim. But, sometimes there’s an animal or doll floating around in my head that I can’t stop thinking about until I sketch out a rough idea of a design. I love exaggerated features, my favorite being big heads and small bodies, so I try to figure out how I can put my exaggerated spin on a design, but still make it cute… it definitely has to be cute!!! I’m ultimately inspired to push myself to design unique and creative patterns by other crocheters. There are so many talented designers out there that I admire and they ultimately inspire me to keep creating. Me: What is your design process like? Do you sketch out your design first? Keke: Although I’m not an artist by any means, I do sketch out my ideas first. I first figure out my color scheme, and then draw a rough idea of what shape and size I’d like each part to be. My least favorite part of amigurumi is attaching pieces, so when I sketch, I try to figure out how to create a design with the least amount of crocheted pieces to attach. As I crochet I write out my directions in pencil and keep lots of erasers nearby – frequent changes are made throughout the process. Me: I noticed you have more patterns for sale on Etsy than Ravelry. Did you first start selling on Etsy and then make the move to Ravelry? Which platform do you prefer? Keke: Etsy was my first and only shop for quite some time. I was in my own little crochet bubble and hadn’t heard of Ravelry until a year and half into my crochet adventures. I eventually branched out to Craftsy and then finally stumbled upon Ravelry. I honestly was intimidated by Ravelry at first, and still sometimes am, but I’m starting to learn how to navigate the site better and get more involved. I have found three of the most fabulous crocheters who have tested many of my patterns, and helped me navigate Ravelry better. Shout out to MixedKreations, Sammy-Cat, and Stitchee-Erika 🙂 I prefer Etsy at the moment, only because I feel confident in using it, but as I learn more about Ravelry and interact with others, I love the community and support I get from it. Me: What is your favourite pattern that you have designed? Why? Keke: I have to say that my favorite pattern is Chick-A-Dee, my very first creation. She holds a special place in my heart and always will 🙂 Creating Chick-A-Dee gave me the confidence as a designer to continue my path in crochet. Me: What is your most popular pattern? Keke: Domino The Dog is definitely my most popular pattern. I’m still sometimes shocked and pleased at how many other people love him as much as I do. It makes me happy that other crocheters like my patterns and are excited to create them as well. Me: Which of your patterns have surprised you the most in terms of how popular they are? Me: What is most challenging for you as a designer and creative business owner? Keke: My challenges come mostly from within and the pressure I put on myself. I’m a perfectionist and am always trying to figure out how to make sure I have the perfect pattern, pictures, and videos for my customers. I don’t ever want anyone to feel like they wasted money on a pattern, thought it was too difficult to understand, or not well written. It’s also challenging to keep fresh ideas flowing. Creative ruts happen from time to time, but I just try to give myself time to get inspired instead of trying to force it. Me: Any advice for those that are thinking about starting to design themselves? Keke: Pick up that hook and yarn and just do it, you’ll be proud and happy that you did! Begin designing with basic shapes and experiment with eye, nose, and mouth placement. Figure out if you like the look of crocheting in the back loop only or through both loops. Decide if you like cartoon-like figures or more life-like designs. All of these things will ultimately help you find your unique style and come up with your first design. Me: Do you have a tip for those just starting to learn to make amigurumi? Keke: My tip for crocheters new to amigurumi is practice really does make perfect. We all have our own style and way of crocheting, so stick with it and find your unique style. Your first few amigurumis are going to be just as adorable as your 100th, because it’s all what you make of it. Best of luck on your crochet adventures! Me: Where can people find out more about you? Thank you Keke for sharing your story with us! There are still a couple weeks left for the Ami-Along – plenty of time to make more amigurumi to enter for prizes, especially since there are so many small and quick patterns you can make (including those by the designer in this interview!). I have been interviewing several designers that are taking part in this years Ami-Along, including Melissa of Melissa’s Crochet Designs, Mevlinn of MevvSan, Justyna of Cute and Kaboodle, and Alyssa of Monster’s Toy Box. Today, I am happy to introduce to you Chloe of Amination! You can find her designs on her website, Craftsy, and Ravelry. Hope you enjoy learning all about her and her design process. Chloe: My name is Chloe and I live in Athens, Greece. I learned to crochet and knit the basics as a child by my two beloved grandmothers, but it took another 25 years and Stacey Trock’s “Crocheted Softies” for me to get actually hooked! Besides enjoying actually crocheting amis, two things have kept my interest in them so vivid: Ravelry, with its endless possibilities, and the response by children to them (my two nephews being amongst them!). Their excitement is just so fulfilling and encouraging! Crochet is taking up all of my crafty time nowadays, but in the past, I’ve enjoyed pottery, candle making, polymer clay modelling and paper crafting, as well. I also love reading Russian literature, travelling, the sea and summer (preferably all those combined together at once! ), animation, hiking, cooking, etc. Chloe: It all started with the gnome FreshStitches pattern, which for some reason inspired me to modify it into a wizard! I was thrilled by the whole process! So, I decided to modify Stacey’s Leprechaun pattern as well, but this time into a pirate! It started as fun, but soon enough I found myself doodling my own designs! Chloe: It depends. Of course, I have a growing list of animals I want to design, but I don’t always follow it! Sometimes I get a custom order (like the octopus or the minion), sometimes I just get carried away by the season (like the daisy or the Christmas ornaments). The bug world (Earth bound and Fly away) has also been very inspiring to me (I have another buggy coming up! ), as well as the rainbow themed plushies, so many possibilities there! Inspiration can strike me anywhere, really! Chloe: I’m horrible at sketching! That being said, let me tell you that I always make a sketch before I start crocheting the sample! I first google the animal to have a look at the real thing, and then I try to put the general idea of its cartoonish version into paper. It’s a very rough sketch, full of stitch numbers, which actually gets written and re-written a lot! Me: Your patterns are crocheted in the blo (like mine!). Why did you choose to design your patterns this way? 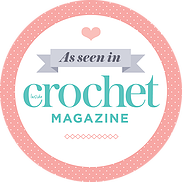 Chloe: I started crocheting in the blo because of the patterns I used at that time. After a while, though, I thought I should try both loops for a change. To sum up, I prefer blo, mainly because I prefer the texture of the fabric that way. Plus, the ridges make it easier to attach pieces, like we often do in amigurumi. However, both loops or flo (front loop only) are always useful for miscellaneous uses (different texture, creating an edge etc). Chloe: It’s hard to say…I love the story behind most of them! I’d say my favourite guy is Aris, the tiny brontosaurus. I hadn’t really planned it at the time, but I made myself a tiny dino, called him Tino, and have been carrying him around wherever I go! It’s been really fun taking photos in the most amazing places! On the other hand, the pattern I enjoyed designing the most is definitely Nina the Rainbow turtle! So challenging handling all those skeins at the same time! Me: What is your most popular pattern? Chloe: The most popular paid pattern is my very first pattern, Ion & Glafki the Seagulls, with the Microcosmos e-books being a pretty close second! On the other hand, the most popular free pattern is already the Daisy. I love all the cute daisies popping out in Ravelry! Chloe: I guess that would be the bugs in general. I know that they are popular as toys and in high demand with children, but I feared that crocheters might get discouraged by crocheting and attaching all the small parts, legs, antennae, wings etc. I’m happily proven wrong! Chloe: For the time being, this creative business only takes place in my free time; after my full-time job, my studies at the university and all the everyday stuff that waits to be done. So, for now, time is the most challenging aspect. I’m sure, there’s much more to it than time, once you get to give your full self to it. Chloe: Go for it! There’re never too many designs! You just need to be thorough with your instructions (especially if you’re a non-English speaker, like many of us! ), provide all the information required (hooks, yardages etc), take clear photos and have your pattern tested (there are lots of people willing to help with that). Provide the same quality, no matter if it’s a paid or a free pattern. Chloe: Practice makes perfect! You need to learn the basics and give it a little time. Before you know it, amazing creatures will fly off your hook! Gauge is almost never important, so that takes a lot of pressure off. Take one step at a time, start with beginner-level patterns and move to more advanced patterns as you go. If you’re enjoying it, you’re on the right track! Chloe: You can read my posts in my blog, check my patterns in Ravelry, become a member of Amination group in Ravelry, follow me on Instagram, or like my Facebook page. And, of course, shoot me an email about anything! Thank you Chloe for sharing your story with us! If you decide to make some amis using Chloe’s patterns, make sure you enter them into the Ami-Along for your chance to win prizes! It will be running until the end of August 2016.